Spray a large nonstick skillet with cooking spray and heat over medium-low heat. Add the egg substitute and cook over medium-low heat. Gently lift cooked edges and tilt the skillet to allow liquid egg substtute to flow under the cooked portion. Continue cooking in this fashion until all the liquid portion of the egg is gone. Gently flip the cooked egg with a wide spatulat. 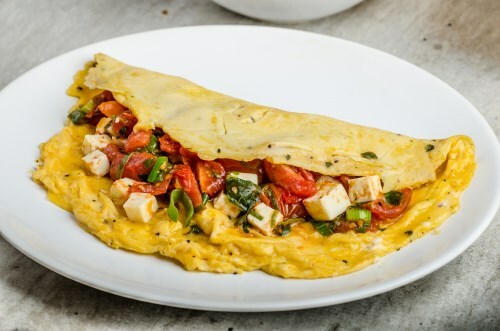 Place the basil, diced tomatoes and feta cheese over half of the omelet. Fold omelet over and heat through.